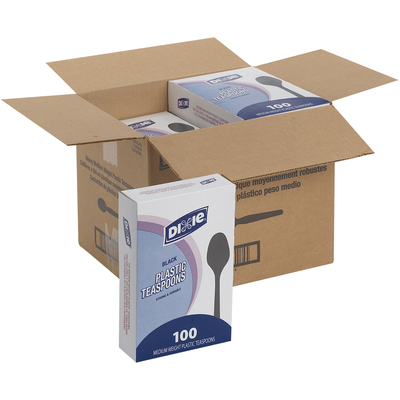 Plastic Teaspoons With An Elegant Black Color Are Ideal For Office Parties, Luncheons And Breakroom Use. Use With Cold Or Hot Foods. Utensils Are Made Of Medium-Weight Polystyrene For Rigidity And Flexibility As Well As Shatter-Resistant And Durable. They Are Conveniently Packed In Grab 'N Go Boxes. Each Teaspoon Measures 5-7/8".. 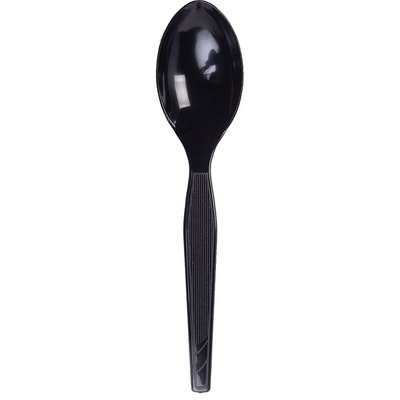 Plastic Teaspoons With An Elegant Black Color Are Ideal For Office Parties, Luncheons And Breakroom Use. Use With Cold Or Hot Foods. Utensils Are Made Of Medium-Weight Polystyrene For Rigidity And Flexibility As Well As Shatter-Resistant And Durable. They Are Conveniently Packed In Grab 'N Go Boxes. Each Teaspoon Measures 5-7/8".